As I need a distraction and the milk, slowly turning to yogurt in my oven, doesn't provide much of a show I will write more silly nothings. Plus it has been a while since I've updated you on my running. And who doesn't love graphs? First the good news! The donations are coming in. You surprise me each year. In case you haven't donated yet, consider it today. you don't want to miss out. Right now Fred's Team is edging out H.O.M.E. 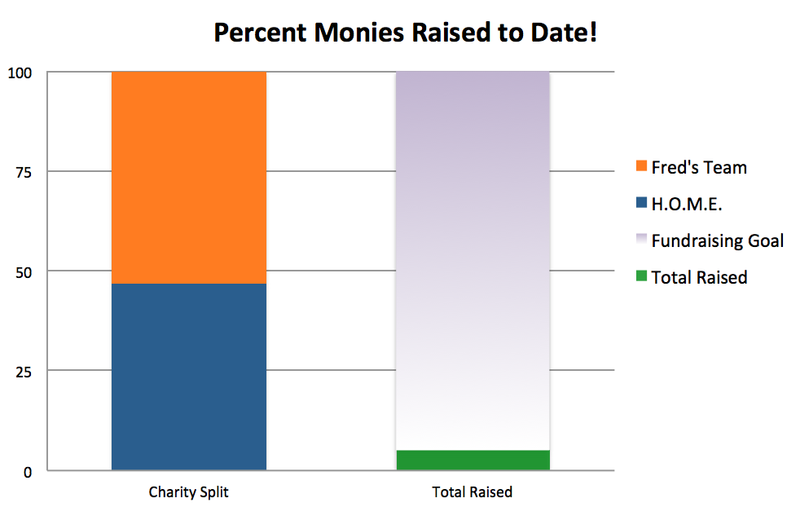 with 53% of the donations. Combined, you've raised 5.1% of our goal! This is a great start. And now for other good news. The running is going well. I've avoided injury. I'm stretching a bit better than in the past. I exfoliated my toes by running on the beach a few weeks ago. And I'm enjoying each run - even on days like today where I had to swim through the moist air. Lately I've been reading up on acoustic waves for a project at work. Applying my kindergarten level of knowledge and understanding the the graph below I'd say that the amplitude is increasing in my training paces. A higher amplitude means, of course, that there is more energy in a wave. This is obviously true for my running too. Or at least it feels like it. 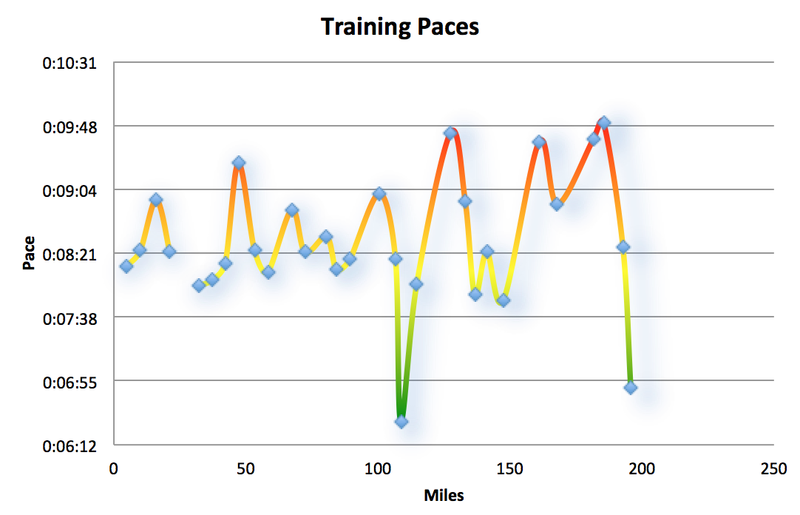 The training plan I'm on has many types of running days. Some runs are to be done at marathon pace (in the future I'll mark these on the graph). Some are to be run at a more conversational pace (minor gasping aloud). And some are to be run with with intentional variations in speed. I'm not sure what all that means - for me or for waves - but I'm putting my trust into the online coach. I know most of you are holding off on donating so that you can use the Marathon Donation Multiplier, see link above. And while it may be hard to estimate my race day running pace from the above chart, this second one might be a bit more useful. 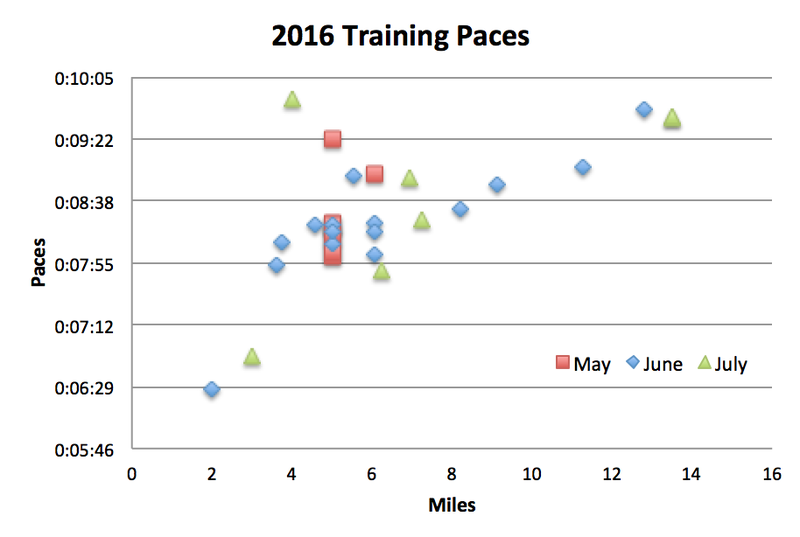 Below I've plotted my runs by month, distance, and speed. As July bleeds into August and September quickly follows you will see the miles lengthen and hopefully the runs quicken. 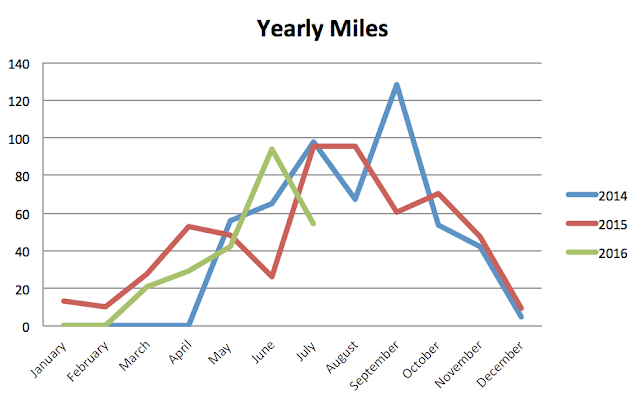 Lastly, just in case you think I'm slacking off compared with bygone years, here you can see my miles from my two previous marathon training sessions. I think I'll be setting a July record this year. As long as I don't injure myself! I think I'm going to PR in Portland. The question is, for you donation multiplier player, by how much!